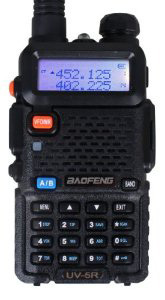 The Baofeng UV-5R is a cheap Chinese handheld radio with a frequency range of 136-174 and 400-520 MHz. 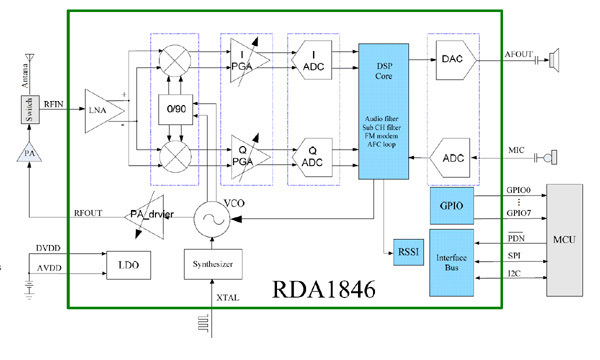 Because this device uses Software Defined Radio technology (SDR), unfortunately it is not possible to equip this radio with a discriminator output. The heart of this transceiver is an RDA1846. This IC houses a complete transmitter and receiver. Modulation, demodulation and audio filtering takes place in the 'DSP Core', the Digital Signal Processor. Because all this happens deep inside the IC, access to the unfiltered audio is not possible.